An upcoming reality television show focusing on Pac-Man might reveal the truth behind his compulsive overeating. Pac-Man is being made into a reality television show. I repeat, a videogame about a yellow circle that is chased by ghosts while trying to eat as many dots and fruits as he can, is being made into a reality television show. 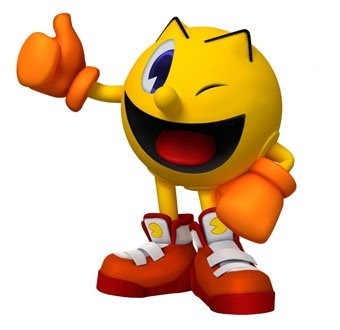 Namco Bandai teamed up with Merv Griffin Entertainment for the development of the idea, which is currently being shopped to networks. Considering that Pac-Man isn't real, unless I'm mistaken, it seems like it'd be tough to create a reality television show about him. This is true. The production appears to be more of an unscripted Pac-Man themed game show, rather than The Real World starring Pac-Man. Merv Griffin Entertainment president of television Roy Bank compares it to Wipeout, a show that features people trying to make their way through outlandish obstacles over pits of mud. "The idea we have is to take what Pac-Man is and bring it to life, to bring what is essentially the world's biggest game of tag to television," Bank told Deadline. I'm envisioning Wipeout mixed with Amazing Race, a reality show about teams of two traveling around the world while completing various tasks. Exactly how Pac-Man will tie in isn't known, but yellow, pink, blue, red, and orange costumes are probably involved somehow. It'll be interesting to see how the show actually works, if it eventually gets picked up by a network.